Scoliosis is a common spine condition whereby the spine curves in the shape of letters C or S and is known as one of the causes for severe back pain. While it can affect individuals of all ages, more females suffer from scoliosis more than males. For scoliosis patients, the chances of increased back pain is higher when sitting for long periods including sleeping. Given that there are several types of scoliosis the first approach to help lessen back pain is finding a good sleeping position. Scoliosis sufferers require extra support using pillows under the neck or under the knees. These pillows help to ease off the pressure exerted on such points for pain relief. It is essential to note that poor sleeping positions do not cause Scoliosis. But, if you suffer from the condition, adopting the right sleeping posture can help relieve the pain significantly and will help to alleviate the problem of scoliosis. There are several pillow types to help with both comfort and in minimizing pain. We identified the following pillow types folk use for back and neck pain management: body pillows (also known as maternity pillows), cervical pillows, orthopedic pillows, lumbar or neck pain pillows,. But before you can add any cushion, it is essential to check with your physician for safety. Here are reviews of our top picks of the best pillows for Scoliosis. No matter which you choose, each of these amazing pillows offer a great deal of comfort, support, and affordability, and can help you on your way to getting a better night’s sleep. This cervical pillow comes in an integral design which helps to relieve discomfort from the neck and shoulders. The pillow works for people that suffer from tension headaches, whiplash, fibromyalgia, and other arthritic issues. The pillow is designed for specialized neck and back care. This feature makes it suitable for people with Scoliosis. This doctor-approved pillow comes in different sizes to suit individual needs and different ages. It has a full size, a travel standard size, and a travel junior. It also has the extra-soft design, the pump-up size, and the junior size to suit everyone. The pillow comes with a cotton blend cover which fits a standard size pillowcase. It has an extra-soft center to support the head and ease of the pain from pressure points. 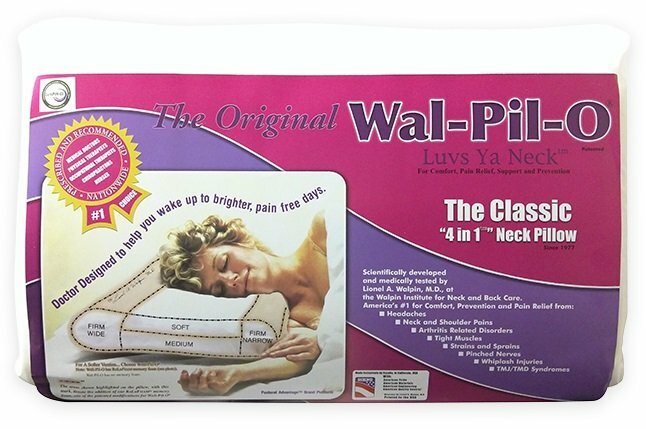 The reviews highlight the pillow has been successful in solving chronic neck and back pain during sleep. “The quality is outstanding” raved one reviewer and is highly supportive around the head and neck. Although it is quite thick, most people recommend it for its supportive feature and soft feel. A U-shaped body pillow commonly used in pregnancies provide amazingly great lumbar support. It’s unique shape and design makes this pillow suitable for people with Scoliosis and chronic back pain. With a body pillow you have support between your knees and something to grab onto when resting in a sideward position. It helps support the neck, the shoulder blades, upper and lower back. This body pillow works for side sleepers but can be modified to suit different sleeping positions to help with relieving thoracic and lumbar pain while providing ample support for the head and neck. It has a soft touch and has the right bounce to support pressure points while ensuring you are comfortable all through the night. The cotton cover is removable for cleaning and retains its high quality even after washing. 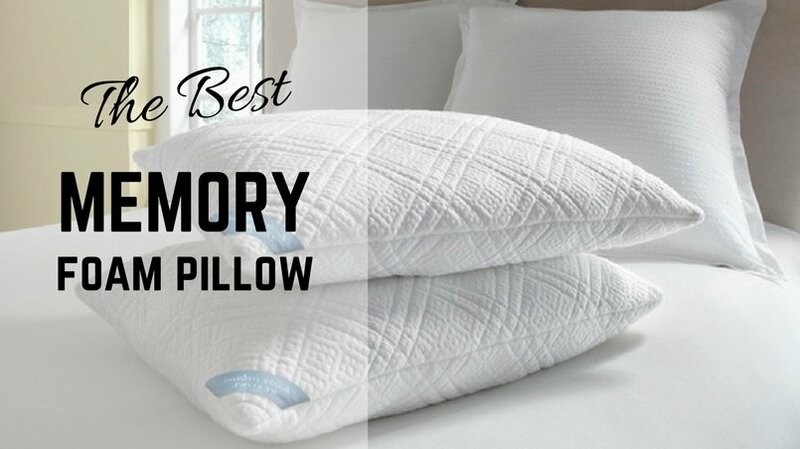 Among the many reviews this pillow has received, the underlying theme is that the pillow is indeed built for quality, support, and durability. It is firm enough for comfort but soft enough for a bounce as you sleep and works for multiple sleeping positions. Although this pillow felt too firm for some, it worked particularly well for those that needed the extra support for pain relief. For scoliosis sufferers investing in a good quality body pillow is important. 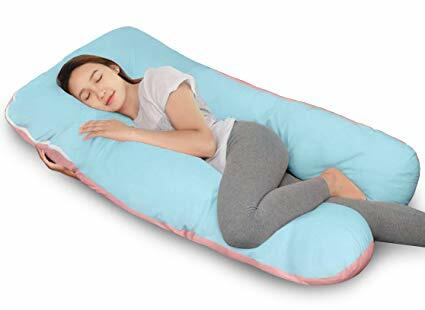 It may feel odd at the beginning if you’ve never used a body pillow before but many who have tried it felt their back problems weren’t as pronounced as before when using a regular pillow. 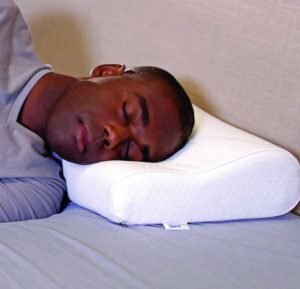 This Tempurpedic pillow is designed to help with supporting the neck and easing off the pressure from the back. It gives the back proper spinal alignment. It helps the neck and shoulder muscles to relax ensuring you have a restful night for a painless morning. This pillow aims to get the right combination of both comfort and support. The ergonomically shaped pillow works well for side sleepers and back sleepers. In these positions, it helps to keep the spine well-aligned without forming any curve along the spine. This feature makes it suitable for people with Scoliosis and other back and neck issues sleepers. The pillow has a quilted cotton cover which can be removed and washed and comes with a generous 5-year warranty. Some people swear by Tempurpedic pillow for relief from back and neck issues while others prefer sleeping at night with no pillows. The supportive feature stood out as the most appreciated among sleepers. Some customers stated that it came with a strong new smell which faded after a few days of airing it out. 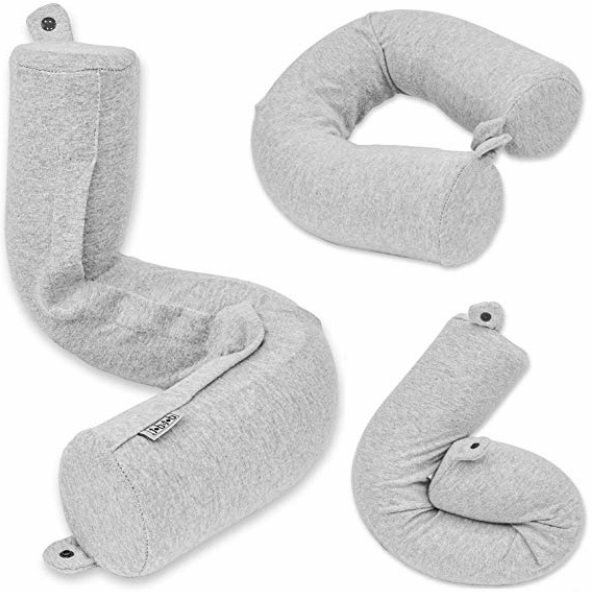 This Tempur-Pedic TEMPUR-Ergo Neck Pillow is available in Small, Medium, Large and Travel. Another Tempurpedic pillow that is all-purpose and all-functional comes in a peanut shape which makes it useful for different purposes. It works as a neck roll, a lumbar cushion, or a leg spacer. It has a strap at the end to carry it easily. This feature makes it a suitable travel pillow. Additionally, it is made of a pressure-relieving material for ultimate support. The Tempur-All Purpose pillow has a soft velvety feel and a firm, supportive filling to relieve pain around the neck, shoulders and the knees. This pillow comes with a removable cover which is made of premium cotton material. The cover can be washed and replaced. Sleepers that used this pillow mentioned that it was ideal for traveling. It provided the right support around the neck for long trips and helped to ease off the pressure on the lower back. It’s also small enough that if you’re sleeping on your back it fits neatly in the curve of the spine some have found helpful. On the negative side, it’s a little on the firm side. But, those that suffer from extreme neck and back pain when traveling recommended it for it’s firm texture. It too comes with a 5-year limited warranty. 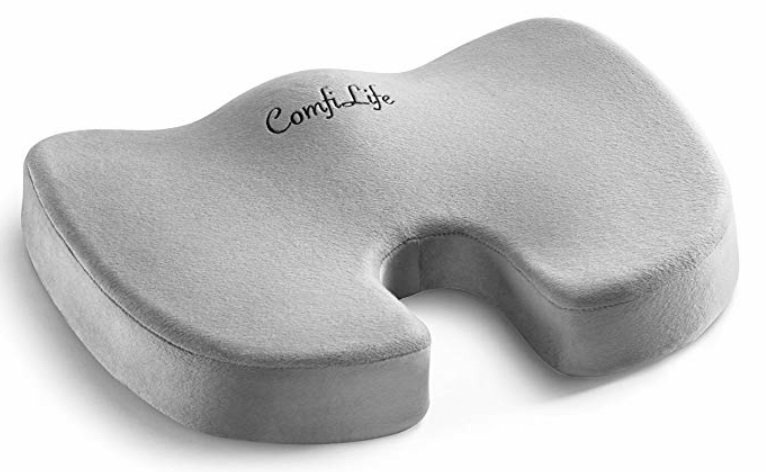 This ComfiLife pillow has a U-shaped cut out made of 100% high-density memory foam that promotes a healthy posture for long working hours or while driving. The ergonomic design provides the right support for the neck area while ensuring you are comfortable for long hours of use. It helps with most back problems including tailbone injuries associated with poor posture and sciatica. The pillow has a non-slip rubber bottom and a built-in handle to carry it easily. It works well for chairs while driving or long-distance traveling. It provides the comfort needed when sitting or leaning on hard surfaces. The pillow has a removable cover that comes with a zipper for easy removal and offers a 100% money back guarantee. One of the features that customers loved about this pillow is the high support it gives for folk with back, neck and shoulder issues including Scoliosis patients. It has proved to be a suitable pillow for long distance driving and long hours of work at the office. It is quite on the firm side, but that makes sense for the support required. The design of this Dot & Dot Twist Memory Foam Pillow/Wrap allows you to twist it for the most comfortable position. This wrap works wonders and is so versatile. It has memory foam so it heats up and contours to your shape. 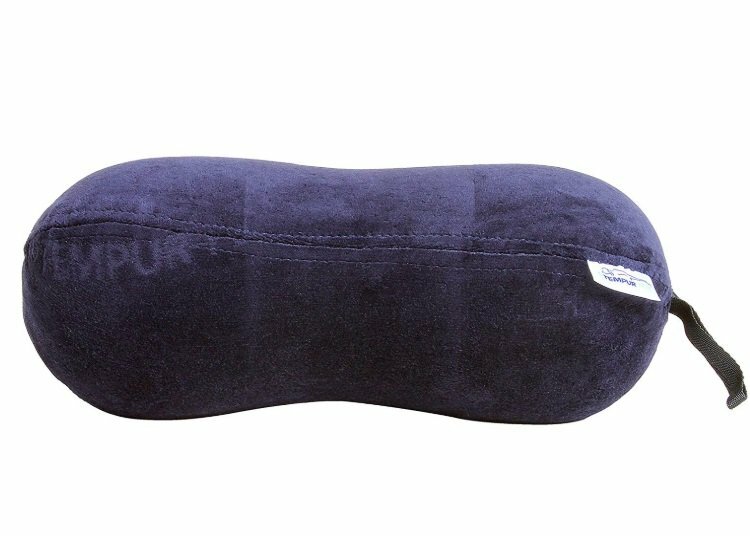 This travel pillow has exceptional support qualities which help to ease off the pressure around the neck and shoulders. The pillow also works for people who have Scoliosis since it can be fitted under the neck or knees benefiting you from gentle lordotic support. Maintenance is easy, you can remove the cotton cover for washing. Additionally, it has a strap closure attached to the cushion for easy carrying while on travel. Sleepers found this pillow to have excellent neck support with its flexible design. Additionally, it worked great for long travels by road or on the plane. Although the pillow needs readjusting for long hours use, it is helpful for supporting the neck and shoulders. When you have scoliosis, finding a good sleeping position can be a huge problem. And a lot of the issues can stem from using the wrong pillow. Regular pillows provide little to no benefit. Finding a good supportive pillow is a good start to get extra relief from some of the pain. Consider the size of the pillow, your sleeping position, the shape you require and where you lack the support. There is no one pillow that works for all sufferers. Do some research, and experiment to figure out what’s the best pillow for you; what works for others might leave you feeling lousy and exhausted the next day. Prior to buying a pillow however, it is best for people with specific health concerns to always consult first with their trusted physician. Can Mattress Toppers Cause Lower Back Pain?